The iPhone can run “web apps” very easily. These web apps are really just specially-crafted web pages that take advantage of the iPhone’s built-in web browser. Such web apps can be very cool, but they don’t provide the full functionality that you can get from an actual executable program running on the iPhone. A “native app” that runs on the iPhone can read the iPhone’s built-in accelerometer, for example. So lots of people want to write independent/third-party native apps that run on the iPhone. The problem is that while Apple hasn’t squashed the development of native apps, they haven’t helped, either. For example, Apple hasn’t provided a toolchain to compile programs for the iPhone. Here’s the process as I recall it. 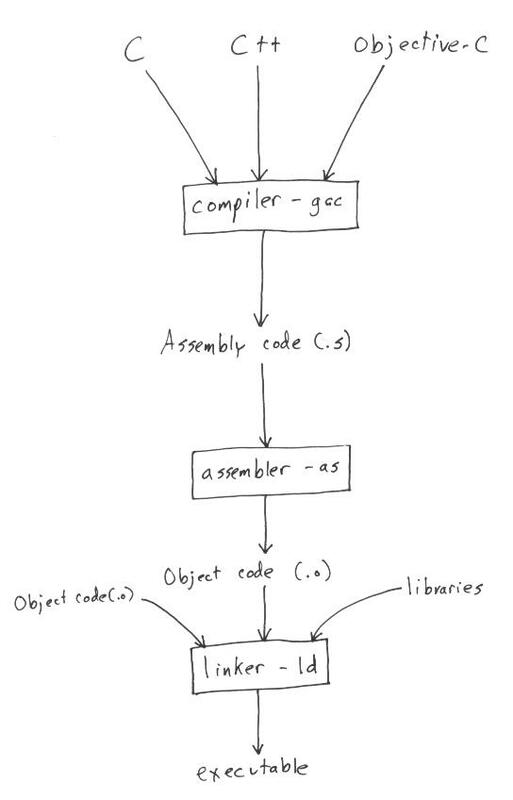 You write code in high-level computer languages such as C, C++, or Objective-C. That gets piped through a compiler (“gcc” in this diagram), which creates assembly code targeted for a certain type of machine architecture such as Intel x86, PowerPC (PPC), or ARM. Most desktop machines, including newer Apple computers, use Intel or Intel-compatible chips. Older Apple computers use PowerPC chips. ARM chips are embedded in lots of popular consumer electronics devices (e.g. the iPod and iPhone). Now you’ve got assembly code for a particular type of computer chip. That code is processed through an assembler (“as” in this diagram), which spits out actual machine code (also called “object code”) of zeros and ones. In some cases that code can be executed directly. However, usually you have multiple files of object code to combine, or you need to link in built-in functions from system libraries. A linker (“ld” in this diagram) pulls all the object code into one executable program that a user can run. So what is a toolchain? Roughly, a toolchain is a set of programs that allow you to compile source code into a program. It can include the programs that I just mentioned, plus a host of other programs such as “make” or a debugger that make compiling programs easier. Look back at the diagram above. Typically someone on (say) a newer Apple computer would have an Intel chip inside. So gcc would output assembly code for an Intel chip, and that assembly code would eventually be transformed into an executable program that runs on a Intel chip. That lets you compile and run programs on your own computer. But nothing in the diagram above says that you have to output assembly code for the same type of computer chip as the machine that you’re running. For example, an Intel-based Apple computer could translate source code into assembly code for an ARM-based machine architecture. That’s called “cross-compiling,” because you’re compiling your code across for a different type of chip. Why would you want to cross-compile anything? Well, iPods and iPhones are based on ARM chips. Can you imagine trying to compile source code on one of those little devices? It would be a real pain. Cross-compiling solves that problem: you can compile code on a desktop machine for (say) the iPhone, then figure out how to copy your executable program over to the iPhone, and figure out some way to run your program. What does this have to do with the iPhone? It’s possible (but currently difficult) to make a working toolchain for Apple computers that cross-compiles code so that the iPhone can run it. Once you have a cross-compiling toolchain, you can write code that runs on the iPhone. Unfortunately, Apple hasn’t provided any documentation on the application programming interface (API) or system libraries that would allow people to write native applications for the iPhone. Luckily, dedicated people have helped to produce not only a toolchain but also to fill in documentation on the system APIs that the iPhone supports. In the same way that Apple desktop machines have a framework called AppKit, the iPhone has a user-interface (UI) framework called UIKit. If you dig deeper into nearly anything I just said about toolchains or cross-compiling, you’ll discover that it’s more complicated than I just laid out. For example, libraries of built-in system functions don’t have to be statically combined into a program. It’s possible to wait until the program is being loaded to execute before linking in a library. And so-called “binutils” provide lots of functionality other than compilation. For an overview of the compilation process, see the book Running Linux for a good description. To learn about linking vs. loading, I enjoyed this Linux Journal article. You can read more about GCC or binutils on the official GNU site. And of course Wikipedia provides a variety of strong articles about the GNU tool chain, linkers, and crosscompiling. are you almost done with this iPhone dribble? Can you send a message to the 95% of us who read your blog looking for insight on Google when you’re done sucking hard on Apple’s teet ? Enough already with the iPhone… this blog is really beginning to bite pretty bad. We all knew you were a total nerd because you work for G! and do the nerd conventions but this is puke. have you seen the film “Yesterday” ? the one about the African woman who gets HIV from her husband who is very promiscuous and he makes a fool of her in the village yet she takes care of him until his death because all she wants is for her daughter to go to school which she had never the opportunity.. They just don’t want to deal with a bunch of apps that will crash until they get a good market share. Besides, if they made it easy, it wouldn’t half as much fun for the people doing the hacking. Unravelling the puzzle is most of the fun for some people. In a year or two there will probably be a full slew of apps for the iPhone. Minor nit: These days, many programs are dynamically linked … so just references to external libraries are in the final executable. Some advantages of this are smaller .exe’s, shared code in memory (how many programs use libc? ), and “instant upgradability” when those shared libraries are patched. Mechanisms are in place via versioning (often minor/major numbers) to handle cases where the interface/behavior should be identical and/or allowed to change. I think you’ve entered a time warp. We are back in the day where the best selling computer book was “Undocumented DOS” and the evil giant was shifting from IBM to MS with the current possibility of the cycle moving to include Apple. Thanks for the recap on CS 101, I think we called it as the ‘seperate compilation process’. Btw, what is this Objective C. I don’t really remember anything about it. Maybe Gosling can convince Apple to put a jvm in their iphone for third party vendors to write code for it. although discussing Iphone might seem interesting to a lot of people, i think currently webmasters are shaking in their pants thinking about Pr update, or rather lack of it. Could you write a post about what is going on at Google? Why id the update so late, blah blah, etc.? I’m mainly doing this series of posts because I was digging into this subject over the Labor day weekend and found that the whole subject wasn’t that well-documented. So I’m trying to get some of what I needed to figure out documented so that other people can save time and don’t have to figure it out for themselves. Thanks for the link though. alek, absolutely; I just wanted to get the simple version documented. Adnan, Objective C started on the NeXTstep operating system. Apple bought NeXT, so that programming environment (Interface Builder, Objective C, etc.) became the core of Mac OS X. When you see “NS” at the beginning of an Apple system call, I believe that stands for NeXTstep. I am very happy to see you blogging about hacking the I-phone. It obviously is interesting and exciting for you. That is one of the great things about your blog, it is YOUR blog, and you get to do with it whatever you want. If Oprah can talk about hunger in Africa, and George Clooney can talk about the war in Iraq, then you definitely can talk about the I-phone! And for my fellow readers, remember, this is not the Google Press Release and Secrets released so we can make more money SEO’ing our site better site. It is Matt’s I will write on whatever I damn well feel like even if it doesn’t interest you site. Tee hee! I suspect that the dead hand of the mobile phone companies might somthing to do with the locked down nature of the iPhone. Mobile seems to be where the dinosuars go when they cant hack life in a dereulated moden telco – the sort of people who are more backward looking than the SWP activists. The post took me back to the days when i did proper (FORTRAN and PL/1) coding on PR1MES ah the days of a compete compile/load sequence that would fix bugs. The new iphone style I pods look cool if you want to play with coding for the platform and arn’t to botherd about the phone access. geting kismet to run on a iphone would be a cool war driving /network security tool. If you are interested in cross compiling for ARM then I would recommend looking at the MokoMakefile which builds a complete system to run on the neo. Even if you decide that you want to hack the iPhone, this may help you learn the concepts. OpenMoko uses bitbake which is like a portage system for cross compiling. I suppose it would be possible to use bitbake to compile for the iPhone, but I am not sure. When are advertisers paying for our Iphones? Just every time we start up our phone some advertiser sends us a message (only 1 a day). In this way Apple can make more money via advertising! What do you reckon? Like google adwords!? I know it’s technically correct, but does anyone else think it’s odd calling C a “high level language” these days? The number of people with any experience at all of assembler seems to be dropping – there are plenty of comp sci courses where it’s not even taught – so I increasingly think of C as “low level”, as opposed to PHP or Python or whatever. Just got my Iphone! I could surf the web with Iphone, and even chat with folks over Iphone MSN, but a bit concern about online securities as it doesn’t look like having anti-virus software installed. May I know from anyone out there… When the Apple iPhone is releasing in India. I would highlight it on my website’s homepage http://www.sendindiagifts.com; Just to make Indians (living outside India)elligible to send iPhones across India to their loved ones. in this case i hav to tell you something.. There is a little source to get flikr fotos videos and more on mobile phone without hacking programms. Do you know about aral Balkan ? SWX its a new way to get native data into iphone or other mobile platforms..
Technical information like Toolchain, Cross compiler, the connection between cross compiler & iPhone is really helpful to know the basic principle of iPhone operation. 1. Do traces of tool chains and compilers remain in the executable file? For example, if I make my software on Windows for OS-X, can I find out if it was made on Windows just by looking at the executable file? Or even using MacRuby to write an OS-X application, is it possible to know it was made with MacRuby by looking at the executable file? Thanks again for the wonderful wealth of information. I will continue to refer back to your blog for future research as well. Looking forward to your response. I read your artical of cross-compiler in your web site. I am a yeyoul Lee. I am currently working for samsung electronics. My major interest is cross-compiler for iphone. Because I want to transfer iphone application to other phone. How can I try to it? Also I am working for development to transfer software which from iphone contract and music, video, photo to other phone. If you have a good knowledge, please comment to me. Recently I have a interest of cloud phone which I imagine. Also unified and shared mobile application store or market. I think that you have a good knowledge for that. Please I want to discuss with you. Since winning the Web 2.0 Expo LaunchPad competition in April 2009, PhoneGap has been widely recognized as a game-changer for mobile app development. The open source code has been downloaded more than 200,000 times and hundreds of apps built using PhoneGap are available in mobile app stores and directories. In 2009, PhoneGap was named by InfoWorld as a top emerging enterprise technology in the category “cross-platform mobile app development”.